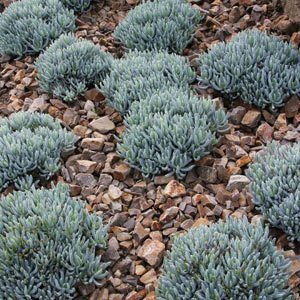 Senecio serpens or ‘Blue Chalk Sticks’ is an easy care species makes an excellent ground cover plant for a sunny position. This is a trailing plant that will slowly spread and is regarded as one of the best succulents for use as a ground cover plant. As a ground cover it can be mass planted and with its turquoise silvery blue leaves and dense growth habit it will quickly cover a large area, making a virtually maintenance free matt. Senecio serpens can also be grown in containers and a can be a great low care addition to a small sunny patio or balcony. The plant is native to South Africa and thrives in Australia except in frost prone and tropical humid areas. The foliage is cylindrical and points upward like little blue sticks of chalk. It will reach a height of around 20 – 25 cm and has a trailing nature. Excellent for growing along a sunny border where it provides year round interest. A dwarf form is available that will reach around 15cm in height. 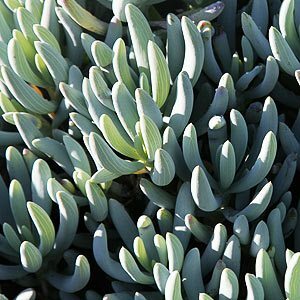 Senecio serpens or ‘Blue Chalk Sticks’ is easy care, requiring little to no maintenance. Some remedial pruning after flowering will help maintain a good bushy clump. Once established this is a drought tolerant easy care plant. Ensure the soil is well drained or hill up the soil to improve drainage. Mulch around the plant with small stones or gravel. In dry hot periods some water may be requires, always allowing the soil to dry between waterings. In good soil no fertiliser will be required, in poorer soil a light application of fertiliser may improve growth. Over fertilisation will cause straggly elongated growth. Position – Full sun to Part Shade, frost free. Height – Will reach 15 – 25 cms in height. Spread – Will form a clump of 1m or more over time. Foliage – Blue/green and upright like fingers. Consider planting on a screed or gravelled covered area. The contrasting colours will add a dramatic effect to the foliage and the screed will keep down weeds in between plantings. Consider that a single plant will eventually make a clump of of around 80 cm when determining planting distance. Excellent for planting in coastal areas where sandy soils provide a free draining environment. This is a plant that is easily propagated from cuttings, both leaf and stem best taken in late summer or early spring.